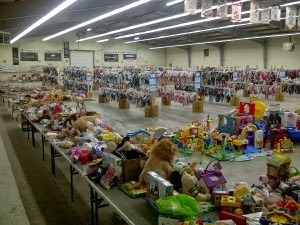 The Saskatoon Parents of Twins & Triplets Organization (SPOTTO) is holding its spring children's clothing and equipment sale Saturday, May 3, 2014, at the Sutherland Curling Club from 9:30 a.m. to 12:30 p.m. Click here for more details. The group will be selling preemie to age 14 children's clothing, baby furniture, cribs, car seats, maternity wear, toys and more. SPOTTO supports the multiple-birth community in and around Saskatoon through information, first-hand experience and advice from fellow multiple-birth families, networking and friendships. Its clothing sales are open to the public in the spring and fall of each year. The sales are small fundraisers for the organization's activities, but almost 90 percent of the proceeds go back to the individual sellers of the clothing and equipment. "The sale gives us an opportunity to get rid of the items our children have outgrown, and pick up the next set of clothing, toys and equipment at bargain rates - which is necessary when you need two, three or more of almost everything!" said one local mom of multiples. During SPOTTO's weekly "Chat 'n Play" groups, parents of multiples can socialize while children over the age of one are supervised. In the summer, informal get-togethers are held at members' homes. The organization also welcomes families who are expecting multiples to all of its activities. It provides "Multiple Expectations" classes to prepare expectant multiple parents for what lies ahead.